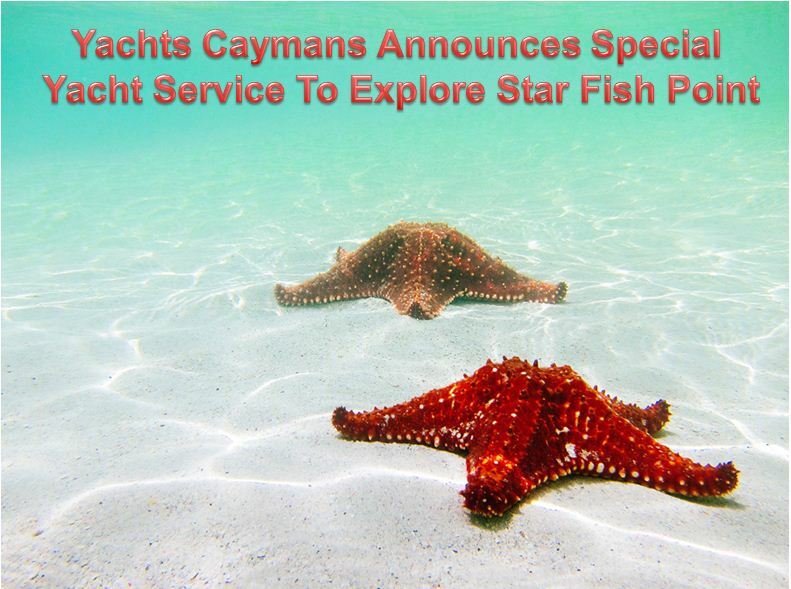 CANCUN, Mexico - July 10, 2017 - PRLog -- Yachts Caymans,has recently announced that they will offer special yacht service to the travelers who wish to spend a day at Star Fish Point in Grand Caymans. The Special yacht rentals will allow guests to enjoy the scenic beauty of Cayman destination in utmost luxury and comfort while enjoying the opportunity to snorkel and look for starfish. It is said that any Cayman Caribbean vacation is incomplete if you have not visited Star Fish Point in Grand Caymans, hence, Yachts Caymans will take you to this unique attraction to make your vacation a memorable experience. While here, enjoy the pure white sand, the clear turquoise water, and the starfish aplenty in the shallows. Starfish Point is a breathtaking expanse of beach found on the northern coast of Grand Cayman. Irrespective of its isolated area, it is perfect for swimming, sunbathing, sightseeing, snorkeling, and lots of picture-taking. Guests can take in the mesmerizing views of the lush green surroundings while they learn about the abundant red starfish populating the area. The crew are also available to take you to Bloody Bay Wall East and West in Little Cayman for they are the best place to dive and look for large orange elephant ear sponges, black corals and wire corals along the sheer drop-off. The Public Relations Department of Yachts Caymans commented, "A private and luxurious yacht cruise is a unique experience for our customers to explore the beautiful Cayman destinations while taking part in the adrenaline rushing water sports activities. Our customers can choose from a number of our luxury vessels that can be chartered during their upcoming vacation trip to the Cayman Islands." Further, many of the additional amenities while on board is free and it comes with a modern, positive, professional and friendly attitude. Aboard the private charter in Caymans, you will have access to a variety of water sports equipment. All these services and latest offers can be availed at amazing rates. The luxury yachts of Yachts Caymans feature great sound systems, snorkeling equipment and complimentary soda and water. Whether sailing or luxury yachting for the day or for a month, the Caribbean is an idyllic choice. For more information please visit http://www.yachtscaymans.com. Yachts Caymans offers unmatched private yacht charters in the stunning blue waters of the Cayman Islands along with the two sister islands of the Cayman archipelago. Whether you want to sail the crystal clear waters of the Cayman, snorkel coral reefs teeming with marine life, have a romantic dinner cruise with your special someone and or enjoy a day or evening cruise with your family on board your own private yacht, Yachts Caymans offers the best options in yacht charters at the best value, tailored to just what you want. Travel in style, and go wherever the winds take you on board your own private yacht charter.